Good evening ladies!! I hope you all had a wonderful Saturday. I had a very BUSY but also a very PRODUCTIVE day. I left the house around 9:0o this morning and picked my Mom up to go shopping. And I am proud to say, actually started my Christmas shopping. Believe it or not, I actually got the majority of it finished today. Nothing like some major power shopping the Saturday before Christmas with all of the other “crazies” to get you in the Holiday spirits! LOL!! But it really was a very enjoyable day with my Mom. Then this evening my husband and I spent some much needed QT together. 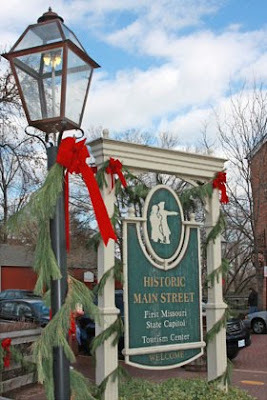 We went to Historical St Charles, MO where we had some dinner and strolled down Main Street. It was SO pretty!! COLD but pretty. But the cold just gave me an extra excuse to pop into my favorite Prim shops. LOL!! Anyway, in the town of St. Charles, they celebrate an Old Time Christmas that is just the neatest thing. I will try to share more pictures tomorrow...but for know, there is more things to check off that list!! Can't wait to see your pictures of St. Charles. I love visiting the shops there. Last time I went was in May and it rained the entire day.